Dash Harness - What is this for? I nearly completed my GTS Dash harness swap yesterday, but there was one thing that I couldn't find a place to plug, as such, I haven't fully reinstalled the dash yet. Can some veterans tell me what this goes to (The one I'm holding)? I'm sure you can tell from the pictures, but it's located in the passenger cavity behind where the glove box would go. 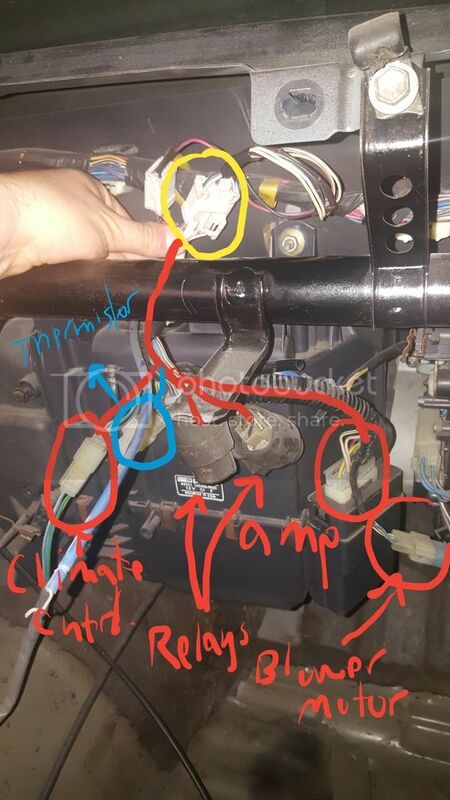 Re: Dash Harness - What is this for? Kitsunami wrote: I nearly completed my GTS Dash harness swap yesterday, but there was one thing that I couldn't find a place to plug, as such, I haven't fully reinstalled the dash yet. Can some veterans tell me what this goes to (The one I'm holding)? I'm sure you can tell from the pictures, but it's located in the passenger cavity behind where the glove box would go. That is one of the connectors for the heater/ac system. I could not locate where this connected into the system. Everything else plugged up somewhere. Hmmm.....it should have another connector to your ac harness besides the 2 wire plug (the other one in your picture). The connector you are missing goes to the pressure switch, ac amp, 2 relays, climate control switches, and thermistor. Edit: Ok I know what's going on....you are doing an sr5 to gts swap....the gts has a different ac harness as well that apparently you didnt get. You are still using your sr5 ac harness? Here's a pic of what the gts harness entails. Ahh, so basically I need a GTS AC harness? Pardon my ignorance guys, last question. I understand that wiring harnesses are different between Zenki and Kouki. I still need to find a front headlight harness. I bought the engine and dash harness from someone in the Bay Area, but now I realize I have no idea which GTS harnesses I have. I trust this guy enough to have sold me compatible GTS harnesses, but I don't know if they're Z or K. I believe the black 'Diagnosis' box means Kouki, but is anyone able to confirm which both my dash harness AND engine harness are? I tried to include as many pictures of the harnesses as possible.